It takes the right scene to truly enjoy any at-home listening, viewing, or gaming experience. Sure, you can watch your favorite movie or TV show on any medium, you can listen to your favorite track using whatever player you have, you can root for your favorite team as you watch the game on any platform. However, if you are thinking about upping your indoor entertainment experience, installing a proper home theater system is just what you need. Let’s look at the main advantages of home theater systems. Contrary to popular belief, installing a complete home entertainment unit is more economical that people think. You can experience it with friends and family and create beautiful memories together. Additionally, if your home comes complete with its own media room, then it definitely can add more value to it. And the great news is you don’t have to devote an ample space for it. Working with a professional installer can help you come up with a superb and fully functional home theater system that works best for your home – and one that you can enjoy for many years to come. The property with a remarkable home entertainment perk is a fantastic selling point. It can function as an investment both for now and in the future. There is simply nothing better than your very own private movie room. More than an added comfortable feature of your home, your loved ones can enjoy it just as much. Super Bowl weekends, World Cup finals, movie marathons – you don’t have to scour your town anymore for a spot where you can enjoy these events with friends and family. Experience them right at home with the people you love. You can also have the power to create the perfect ambiance at your next home event – with the help of your high-quality home entertainment system. Have your favorite people over for a house party, or perhaps a sweet, romantic dinner with your significant other. You can set the right tone, no pun intended, with your top-of-the-line surround sound system. One of the greatest things about installing a home entertainment unit is you can customize it to your preferences. Choose your own equipment. Pick your favorite type of chairs. Assign a theme. Make it as unique as you want. Additionally, just let your home theater contractor know your specifications, and he can work with you to create the ultimate home cinema – from working with the acoustics of your room layout to furniture and accessories arrangement to whatever personal touches you want to put. Whether you’re planning to watch all of the Marvel movies with your friends or family or if you want to have a weekend Harry Potter movie marathon, watching these films in the comfort of your home through an impressive A/V system will bring a whole new level of enjoyment. Transform your simple movie nights into the ultimate home viewing luxury. No longer will you have to put up with noisy movie-goers, long ticket lines, or missing scenes when you need to go to the bathroom or get some snacks. With your own home cinema, you have the control. If you are a sports fanatic, then you should enjoy watching your favorite game using a home theater system. There’s simply no excuse. A state-of-the-art system can give you the most high-def viewing and crystal clear audio. You can feel the excitement as if you are inside the arena. Crisp sounds, incredible imagery. Enhance your game-play by playing your favorite video game on a big screen complete with surround sound. Video games are all about immersion and being part of the virtual world. Get really into the game with a top-of-the-line home theater system. A home theater should no longer be associated with just the most extravagant homes. Having and creating a swanky setup is an achievable goal now – thanks to today’s creative technologies and design strategies. 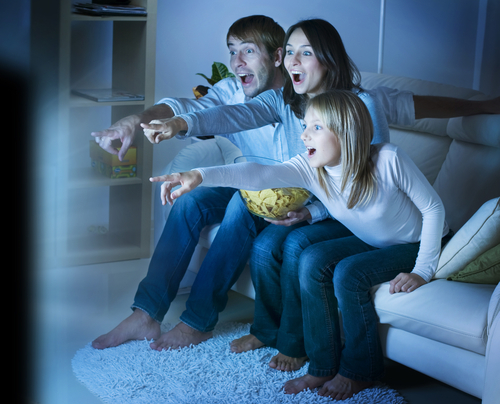 We hope this article helped you decide if you want your very own home theater. Remember If you still have questions, you can always get in touch with your local home entertainment installers.